America and Australia: What are the differences in values? 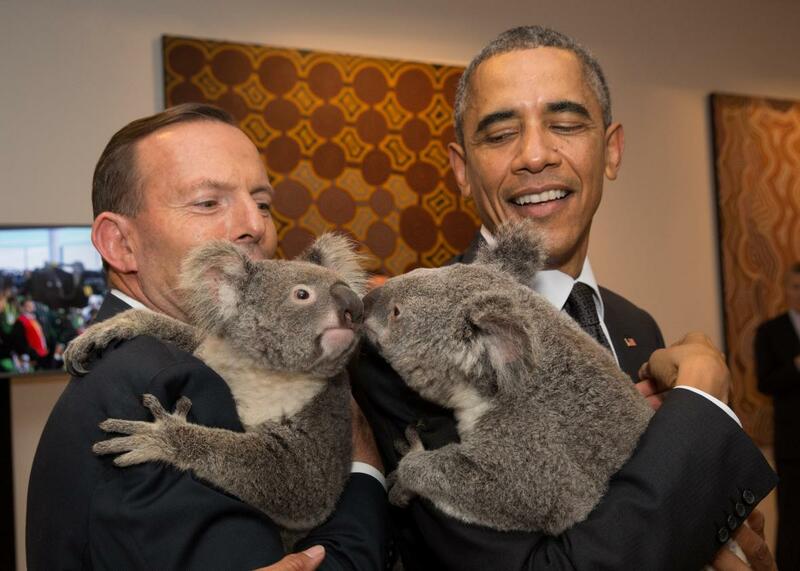 Australian Prime Minister Tony Abbott and U.S. President Barack Obama hold koalas on Nov. 15, 2014, in Brisbane, Australia. There are many big-picture values that Americans and Australians share. As an Aussie, I see that both nations highly value individual freedom and fully understand that it’s not free but rather comes at a significant price. This is why Australia has been one of America’s staunchest allies in every global conflict for more than 50 years in an effort to defend and protect that freedom. They both value the concept of democracy: being governed by a government of the people, by the people, and for the people. So we have each adopted constitutions to protect this system of governance. They also value capitalism and the economic system where a country’s trade and industry is controlled by private owners in a competitive pursuit of profit, rather than controlled centrally by the state. Allegiance: Where Americans generally swear allegiance to the flag or country, Australians swear allegiance to our mates. “Mateship” is far more important and sacred for Australians than patriotism. Politics: Australians would generally describe American politics as mostly center-right, while Australian politics is mostly center-left. Even our conservative party (called Liberals) are probably more left-centered than the American Democrats. Language: Although Americans have generally adopted the English language with some spelling modifications, Australians have developed an entirely new lingo that is full of humour and imagery, designed to both shock and conceal in equal measure and is always irreverent. It joins words to create new ones and constructs obscure phrases to convey thoughts to others in the know. Labor: Where American business is perceived as only viewing labor as an economic means of production used in the pursuit of profit, Australians as a society see labor as fellow Australians who deserve a decent living regardless of their economic bargaining power and contribution. Respect for authority: Where Americans greatly respect and believe in their political institutions and the people who lead them, Australians have a ingrained suspicion of authority and have a strong anti-authoritarian bent that by tradition will even “boo” our prime minister at sporting events. This is perhaps a throwback to our convict past. Champions: Where America esteems the all-conquering self-made, self-promoting champion, Australians honor the underdog … win or lose, Australians love the battlers, the quiet achiever, the people who will “have a go” regardless of the insurmountable odds stacked against them. As the American Stefan Von Imhof explains, it’s not the big things that produce the markedly different values in our two cultures; it’s the myriad of small things where you will notice the difference. His answer explains them all so well. Australian culture: What is the worst aspect of Australia? Australia: Is it completely safe to walk around freely in Australia? American culture, habits, and behavior: What is the hardest thing to get used to after coming to America?